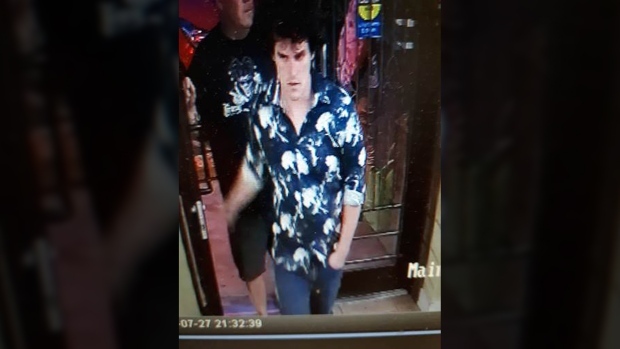 Police are searching for a man who allegedly attacked an employee at a downtown Victoria business in what's being called a random assault. The man entered Liquor Express beer and wine store in the 700-block of Yates Fri., July 27 at around 9:30 p.m. and immediately walked into a staff-only area, according to police. When he was approached by an employee, the man became agitated and assaulted him before fleeing, police say. The staff member suffered non-life threatening injuries. Police say they're looking for a man described as white, between 20 to 25 years old, standing 5'11" with a medium build. He reportedly has "mop-like" brown hair with curly bands and brown eyes and was wearing a dark blue button-up shirt with white flowers on it and blue jeans. Anyone who recognizes the photo of the man caught by surveillance cameras is asked to call police at 250-995-7654 or Crime Stoppers at 1-800-222-8477.